We design most of the gardens we install, but we also work with several local architects and designers to build from their designs. Our first step is the Design Assessment held at your home. 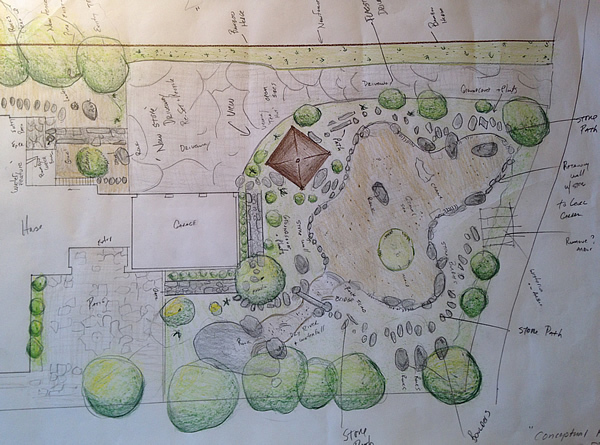 The landscape designer meets with you for about 1 hour for a productive discussion about your property. As trained professionals we are quickly able to assess your property and brainstorm new options with you. Our style is informative and will provide valuable insights about your property. Design fees, job consultations, site visits, clerical and permit fees are usually charged on a time (amount of time spent on your particular design) and material (amount charged for permit and processing fees) basis. More time spent on a particular design aspect means the design cost will increase at an hourly rate. In other words, this is not a fixed cost. We usually give an estimated cost range for design fees. Design and consultation rates vary depending on application, location and who is performing the work requested.